Plexus MA300 (30500) is a two-part 1:1 mix ratio, methacrylate adhesive designed for structural bonding of thermoplastic, metal, and composite assemblies. Combined at a 1:1 ratio, MA300 has a working time of 3 to 6 minutes and reaches approximately 500 psi in 12 minutes and 1000 psi in 15 minutes at 74°F (23°C). This product offers a combination of high strength and stiffness as well as the ability to bond a wide range of materials. 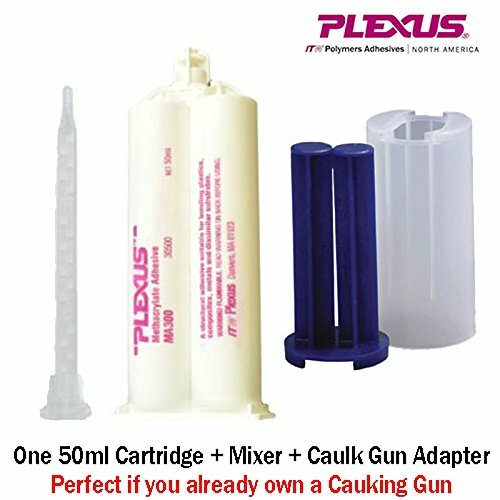 Plexus MA300 is supplied in ready-to-use 50-ml and 400-ml cartridges, 5-gallon (20-liter) pails, or 50-gallon (200-liter) drums to be dispensed as a non-sagging gel. Plexus MA300 replaces an older popular Devcon formula Plastic Welder (14320). It is the same formula inside, but is now branded under the ITW Plexus name. Characteristics Room Temperature Cure Working Time 3 - 6 minutes Fixture Time 12 - 15 minutes Operating Temperature -67°F - 250°F (-55°C - 121°C) Gap Filling 0.03 in. - 0.125 in. (0.75 mm - 3.2 mm) Mixed Density 8.10 lbs/gal (0.97 g/cc) Flash Point 51°F (11°C) Chemical Resistance Excellent resistance to: Hydrocarbons, Acids and Bases (pH 3-10), Salt Solutions Susceptible to: Polar Solvents, Strong Acids and Bases Please Note: This is a kit that includes on cartridge, one syringe, and one adapter that allows dispensing with a standard caulking gun, for medium-duty occasional dispensing. If you plan on regular/frequent use, we advise you use a 50ml Dispenser for this cartridge. This cartridge will fit into any standard 'Square-Back' Dispenser. If you do not have one, please check out the "MixPac 50ml Dispenser" here on Amazon. Cartridge + Caulk Gun Adapter: This kit includes 1 Cartridge, 1 Mixer, and 1 Adapter that allows a standard caulking gun to be used for dispensing. If you have any questions about this product by Plexus, contact us by completing and submitting the form below. If you are looking for a specif part number, please include it with your message.